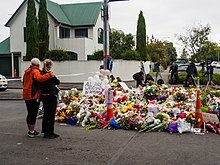 The Christchurch mosque shootings were two consecutive white supremacist terrorist attacks at Al Noor Mosque and the Linwood Islamic Centre in Christchurch, New Zealand, during Friday prayers on 15 March 2019. 50 people were killed and at least 50 others were injured. The alleged perpetrator, an Australian, was arrested and charged with murder. The suspect live streamed one of the attacks on Facebook Live. Many of those directly affected in this shooting may be migrants to New Zealand. They may even be refugees here. They have chosen to make New Zealand their home and it is their home. They are us. The person who has perpetuated this violence against us, is not. Whilst I cannot give any confirmation at this stage around fatalities and casualties, what I can say that it is clear that this is one of New Zealand's darkest days. Clearly what has happened here is an extraordinary and unprecedented act of violence. They have no place in New Zealand. There is no place in New Zealand for such acts of extreme and unprecedented violence, which it is clear that this act was. For now my thoughts, and I'm sure the thoughts of all New Zealanders, are with those who have been affected and also with their families. My thoughts are also with those who are in Christchurch who are still dealing with an unfolding situation. From what we know, it does appear to have been well planned. … There are currently four individuals who have been apprehended, but three are connected to this attack and are currently in custody, one of which has publicly stated that they were Australian born. These are people who I would describe as having extremist views that have absolutely no place in New Zealand and in fact have no place in the world. … I have spoken this evening to the mayor of Christchurch and I intend to speak this evening to the imam, but I also want to send a message to those directly affected. Our thoughts and our prayers are with those who have been impacted today. Christchurch was their home. For many, this may not have been the place they were born, in fact for many, New Zealand was their choice. The place they actively came to, and committed to. The place they were raising their families. Where they were parts of communities that they loved and who loved them in return. It was a place that many came to for its safety. A place where they were free to practice their culture and their religion. For those of you who are watching at home tonight, and questioning how this could have happened here. We, New Zealand, we were not a target because we are a safe harbour for those who hate. We were not chosen for this act of violence because we condone racism, because we are an enclave for extremism. We were chosen for the very fact that we are none of those things. Because we represent diversity, kindness, compassion. A home for those who share our values. Refuge for those who need it. And those values will not and cannot be shaken by this attack. You may have chosen us, but we utterly reject and condemn you. This page was last edited on 27 March 2019, at 00:34.